Robert took to the water the way a boy growing up on Kaua’i inevitably takes to the water—he was led there. Days were spent on the beach, surrounded by aunties, uncles and cousins. Some were relatives, others were family in the way of Kaua’i—part of the tight-knit community, looking out for each other as if they were blood kin. Over time, they taught Robert everything he knows about the ocean. 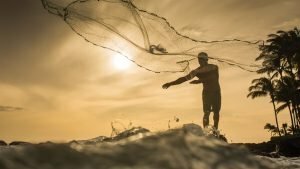 Absorbing hundreds of those pointers, hundreds of lessons—both on the water and related to the land—Robert learned the lore and wisdom of Kaua’i. 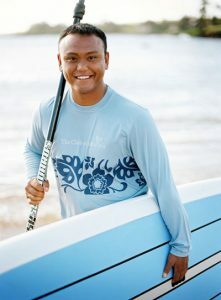 And when he came to Kukui’ula more than a dozen years ago, he helped create the Huaka’i Guides program. He based the outdoor adventure program loosely on his own experiences. “We want people to enjoy Kaua’i the way we do,” he explains. “There’s a specific way things are done on Kaua’i that isn’t exactly like anywhere else.” Like how to paddle an outrigger canoe along the shoreline. Or how to use weather and water conditions to gauge which beach will be best for snorkeling or fishing at any given moment of any given day. Robert can teach those things. So perhaps in the end, the best pointer Robert can give anyone—the lesson that contains the essence of Kaua’i—is how to be present, in the moment, and available. How to open up, unplug and embrace the experiences, memories and life Kaua’i is offering. Learn more about Robert and our Huaka`i Guides program.